This article describes the painting of Steve Barber Models25 mm miniatures Knights at Tournament.The white metal miniatures are sold as 25 mm figures, but with the proper basing,they can be mixed somewhat with the larger, more common 28 mm miniature figures sold elsewhere.I am a great fan of peasants and everyday looking people from the Dark and Middle Ages, and not justwarriors, soldiers, and muscle-bound fantasy figures.Since I have been collecting tavern goers and diners recently, it seemed to fit tohave some royalty and some rich ladies for my miniature scenes. 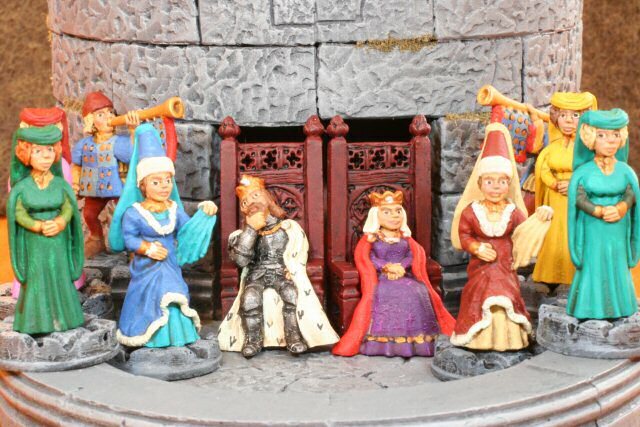 As you can see from the photo, the figures I purchased include a king and queen on richly carved thrones.The King has a wonderfully bored look on his face, while the queen looks somewhat formal sitting with her hands clasped.Both have long formal capes. 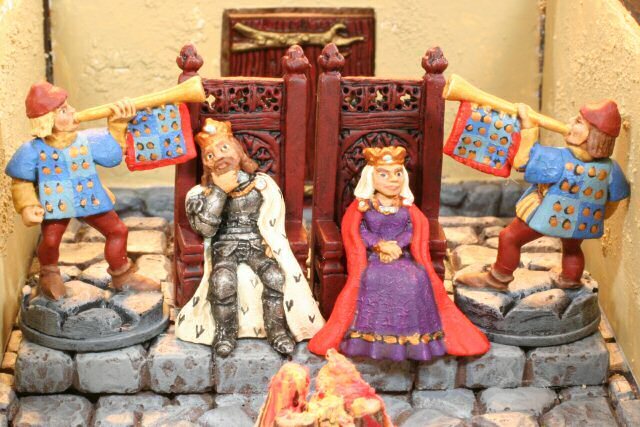 The King has heavy plate armor.There are also two trumpeter heralds and 6 ladies of two different types: one with a flat veiled hat and one with a conicalhat with tail.The manufacturer also makes squires and knights for tournament games, but I have only purchasedthe ones I thought would fit in with my indoor medieval scenes. 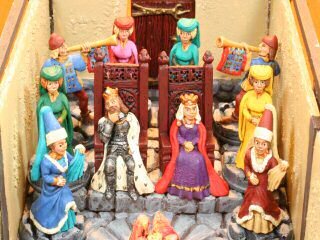 I wonder when this man will stop blowing his horn in my ear, says the bored King. I really feel uncomfortable at these formal affairs, says the queen. The figures are painted mostly with Vallejo acrylic model colors.The metallics are painted with Citadel acrylics.I like the Citadel acrylics because the coverage is more complete. It seems the Citadelmetallics have more particles and less medium.I've tried many metallic paints, but other than the old Testor's enamels, I always seem to likethe Citadel brand for water based acrylic metallics. I had a minor problem with the overcoat of these figures. Normally I paint the figures with acrylics,wash with Minwax Polyshades, let dry overnight, and then overcoat with Testor's matte Dullcote spray enamel.Normally this works with no problem, resulting in a shaded figure with a dead matte finish.However, for some reason the Dullcote pulled and wrinkled the underlying paints.You can see it very well in the queen's purple dress and the herald's surcoats.I don't think it ruins the figures, but it is kind of a strange effect.I don't know why this one time I see wrinkles. The air temp and humidity was normal.However, the spray can was about 8 months old a previously used. And I did somewhat rush my normal 2 coats (about 15 minutes between sprays).If you have any theories, let me know. 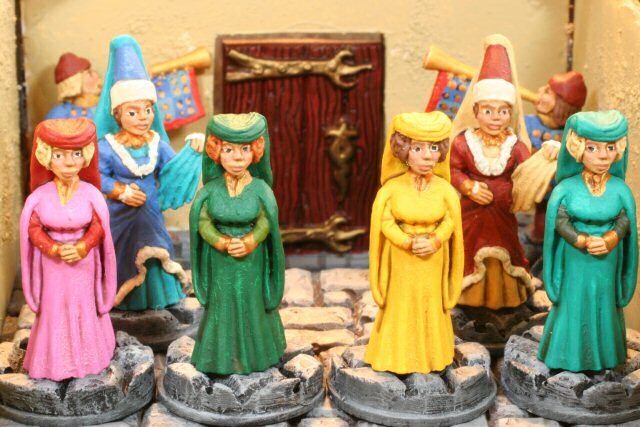 Here are the wonderful ladies of the household.This is one of the few times you can pull out the Vallejo pink, canary yellow, turquoise, and emerald green.Other than Blood Bowl teams, there are not many historical uses of these colors. Although the ladies stand very well, I have mountedthem on my stone floor bases.This elevates them and brings them closer to the size of 28 mm figures. The tournament moves outside the castle. Yet another tournament. Now the king and queen must entertain outside.How boring it is to be royal.Here are the figures set about a Hirst Arts tower model. Expect to find these miniatures in any scene that requires royalty.Judging by the armor and the costumes, these figures are definitely Middle Ages toLate Middle Ages.One day I will mix this set with the Mirliton tavern and banquet goes toget a big feast scene. However, thereare so many figures that I will have to build a bigger hall. Thanks for visiting and reading about my Steve Barber Knights at Tournament figures.I hope you enjoyed reading the details of making and painting them.If you have a similar kit, I would be interested in seeingyour version and the ideas you used to make the scene.More miniatures-related articles are atDan Becker's Miniatures and Models site. Last modified: Thursday, 09-Jun-2011 12:51:44 MST.